A large contingent of European contenders for this weekend's stakes races at Woodbine touched down in Toronto at 7:30 p.m. on Thursday night after a cancelled Monday flight from Amsterdam delayed normal shipping procedures. It was a bustling quarantine barn on Friday morning as the new arrivals settled in to a new routine and ventured to both turf and Tapeta to stretch their legs. Among the new arrivals were Lord Glitters and Stormy Antarctic, who will square off in Saturday's Grade 1 $800,000 Ricoh Woodbine Mile, a Win and You're In Challenge Series race for the Breeders' Cup Mile. Trainer David O'Meara and exercise rider Fearghal Davis walked Woodbine's E.P. Taylor Turf Course on Friday morning before sending the talented grey Lord Glitters out for a spin. 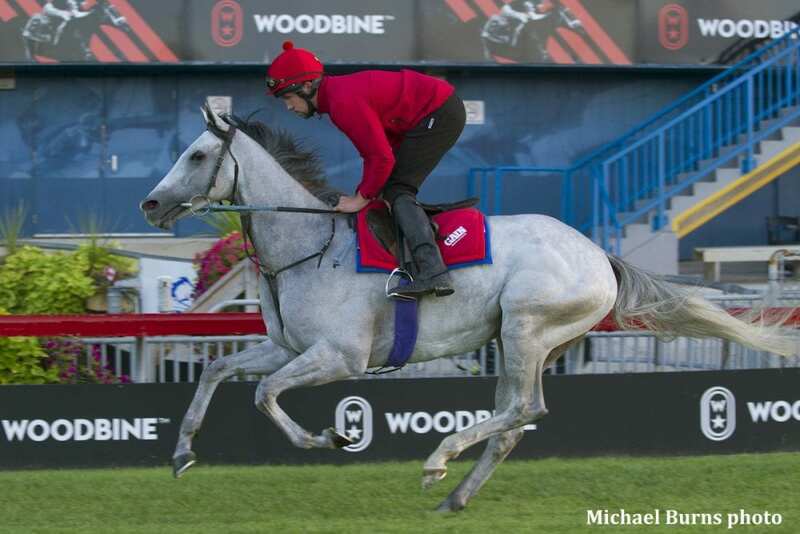 Davis piloted Lord Glitters through an easy training session as the 5-year-old Whipper gelding experienced Woodbine for the first time. O'Meara and owners Geoff and Sandra Turnbull teamed up to win the Ricoh Woodbine Mile in 2015 with Mondialiste. If all goes well on Saturday for Lord Glitters, O'Meara envisions another crack at Ascot. “We are delighted with how well Mondialiste has settled in to his role as a stallion here at Elwick Stud,” said Geoff Turnbull. “He took to his first covering season like a natural and has showed an excellent rate of fertility. We are extremely excited to welcome in the new year and to have his first foals on the ground. The 5-year-old gelding has been in career form this year with in-the-money finishes in his five starts including wins in a Group 3 in France and a Group 2 in Germany. Gérald Mossé will ride on Saturday. “It's been good. He's handled it quite well so far. He's a good traveler. He's been as far as Hong Kong and travels well,” said Gary Plasted, senior travelling head lad for Walker. “He just walked all the way around on the grass for a mile and a half and then had a bit of a trot. Trained by Jessica Harrington, Chicas Amigas was recently seen landing second behind stablemate Servalan in a listed race at Naas. The daughter of Dragon Pulse enjoyed a tour of Woodbine's Tapeta surface here Friday. “She traveled well. We sent her for a lovely little trot for a circuit and then had a four-furlong slow canter. We have an All-Weather surface back home. She'll be used to that and just keep her on the All-Weather and save the grass for when she runs,” said exercise rider Andrew Leigh, who is hoping his first trip to Canada will be a memorable one. “The filly looks well and looks to have recovered well after the flight. We'll cross our fingers for Sunday,” said Gadbin. Gadbin was on hand to watch the daughter of Vision D'Etat travel over the Tapeta on Friday. This entry was posted in Breeders' Cup and tagged david o'meara, lord glitters, Richo Woodbine Mile, woodbine by Press Release. Bookmark the permalink.